I stay in South-Africa & it's halfway through fall on it's way to winter. At a nursery I bought some fruit trees since they went for half price, but what worries me is that in the winter the temp drops to about -6 'Celcius sometimes. Should I transplant them into pots & keep them in the house untill the risk of frost is over or what? Will the light in the house be enough? Can I keep these plants in the house untill then or should they go outside? After winter has gone, can I plant them outside & just wrap them with frost protection cloth up the next winter? Ps. 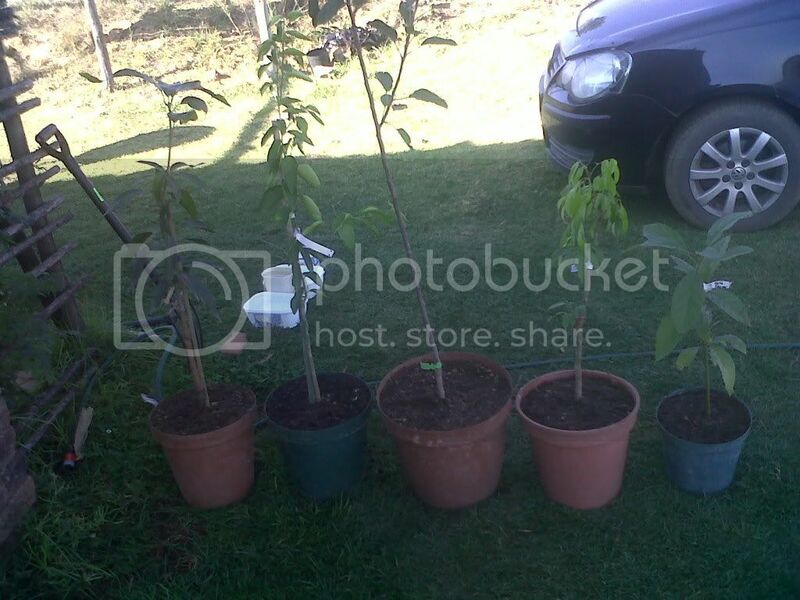 They are apple, lychee, mango, lime, raspberry, blackberry, strawberry plants. The trees range from 70cm tall to 1.3metres. Are they currently in pots large enough to support them? A lot of times, sale plants re already pot bound. I think mango, lychee, and lime should probably be kept from subfreezing weather, but the other trees should be allowed to go dormant and stay outside. Just be sure to protect the roots from freezing solid. Apples, Raspberries, Strawberries and Blackberries are all quite happy at those low winter temps. In fact they can all take far lower than that. The Mango will not tolerate that low a temp. The Lychee will take a small frost but not to much. The lime will tolerate the lowest of this group but I would protect it while it is young. So I would pot these three and give them protection in cold weather. They are in Plastic bags filled with potting soil, but I think the plants outgrew the size of the bag a long time ago as it looks like a leg with a shoe on. I want to know if it's ok to just remove the bag & put the plant in nice big containers & fill up the rest of the space with potting soil. How do I prevent the roots from freezing? Water a little during the day when it's hot? Won't the frost damage the outside plants? How important is it fot the outside plants to go dormant? What is the reason for that? Do you think the mango & lychee will have enough sun in the house? Do they loose their leafs during winter or not? I don't think so? Jona, at what size do you think it will be ok to plant the lychee etc. outside? I guess I will need to cover them right? Can I transplant the apple tee outside now or do you think I should rather wait untill spring? You can plant the apple as soon as you like. The lychee ...with the temp dropping as low as you say it gets, I would keep it in a large pot for a few years so that you could protect it easier. Here are the trees that I transplanted today. 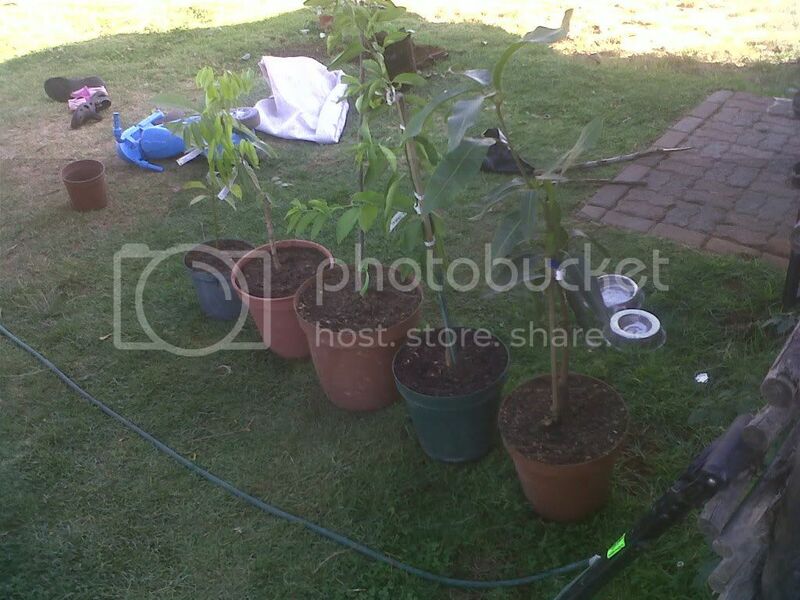 Ok then, I've noticed that the lychee, mango & avo tree seems to be wilting. The others are doing fine. The above mentioned trees are kept indoors, although the temp indoors is about 10'C during the night. I've also loosened the roots when I transplanted them. Why could they be wilting ? Because it's only the tropical trees, I think it's the temp thing. Or is this because of the transplant? My own potting soil consists of about 2 parts sand, 4 parts compost, 1.5-2 parts peat moss & 1-1.5 parts dairy cow manure. The soil mix has a ph of 6. Was the cow manure fresh? All my tree planting instructions say not to put fresh manure or raw compost in the planting hole. I think this mixture sounds too rich. I would mix in some soil. My all purpose container mixture is roughly 1 part finished but unscreened if large container (with big bits of branches and twigs, roots, etc.) or medium screened for smaller container compost, two parts good top soil from under a leaf or wood pile, and 1 part sand. I may add lime or dolomitic lime to adjust pH with calcium or magnesium, greensand for trace minerals and potassium, and rock phosphate for phosphorous. I would increase the sand to something like 1.5 parts for plants needing good drainage. For large containers, I also add small gravel and composted bark chip mulch. Typically I won't add manure or other high nitrogen booster. My home made compost is mostly vegetative with no added manure. When I do need to boost nitrogen, I add reconstituted alfalfa pellets. If you have good compost, I don't think you need peat moss. I'm not using them any more due to environmental concerns. Some people say shredded coco coir is a good substitute, but I think I live too far away from their source in terms of carbon footprint. In any case, some transplant shock is normal and they should be kept in a shady location like base of a tree with no more than dappled sunlight for a few days to a week before moving out to stronger light location. Indoors, keep out of direct sunlight except gentle morning light at first. If there was any root damage, you may need to prune some tip growths to compensate if these have leaves. You need to define fresh manure. It is manure that is totally dried out that I got from where the cows overnight, guess it's about a month old or so. As for the compost, we have a sort of a forest here & I tool some of the compost that was created from every year's leaves & twigs that fell onto the soil. What effect does fresh manute & new compost have on the plants? Do you think I can keep it as is, but remove the manure & add some more soil? And What about the Peat moss? That keeps the soil nice & loose & lowers the ph. Should I rather use lime to lover the ph & remove the peat moss? And Why only the tropical fruit? That's another question. Do you think it's a good idea to put some earthworms in the pot as well? When are fruit trees safe from frost?